The most recent Insurance Institute for Highway Safety (IIHS) crash test results for midsize SUVs are in, and both the 2018 Jeep Grand Cherokee and the 2018 Ford Explorer received a “Poor” rating, the lowest possible, in front-end collisions involving the right side of the vehicle. Officially called an “overlap crash,” the front end crash tests found that injuries were more likely from collisions occurring at speeds of 40 mph or higher with both cars, specifically to the lower leg and foot for Jeep Grand Cherokee front passengers, and to the high and thigh area for Ford Explorer front seat passengers. 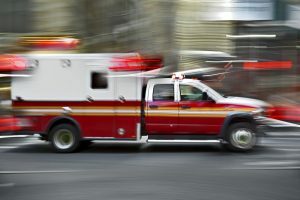 Chicago news outlets are reporting that an ambulance traveling near 28th Avenue and Washington Boulevard in Bellwood, crashed into a building, killing three people including a dialysis patient. The tragedy occurred on Saturday, March 31st and took the lives of Excel Ambulance Service driver, James Wesley, 51, a co-worker, Prentis Williams, 51, and the patient, Larry Marshal Jr., 48, who relied on the private company to get to and from dialysis treatment after he recently underwent a surgery. The driver of the ambulance had been Excel’s EMS coordinator for the last decade. The CDC defines distracted driving as any activity that involves visual, manual or cognitive distraction. In short, distracted driving refers to anything that takes a driver’s eyes or mind away from the road or anything that involves removing a driver’s hands from the wheel. Finding a song on the radio, checking a phone for directions, texting, talking on the phone, eating, applying makeup, searching for something in the glove compartment, and even talking to a passenger all count as distracted driving. Texting while driving is particularly dangerous because a driver faces all three types of distraction. According to the CDC, in the 5 seconds that it takes to read or send a text, a driver going 55 mph would cover the length of a football field. In 5 seconds, so much can go wrong. According to 2015 data, the latest results available from the National Highway Transportation Safety Administration (NHTSA), 3,477 people were killed as a result of distracted driving, the most of any year on record. Of those victims, 67% were teenagers aged 16-19. Driverless Cars: Are They Really Safer? It sounds like something out of a movie about the future: millions of Americans sitting behind the wheel of a car, talking, texting, eating, reading, working, putting on makeup or doing one of many other activities, besides actually driving the car. Driverless cars, also referred to as robot cars or autonomous vehicles, are already permitted (under restricted conditions and times) to be on roadways in certain states. The Government Accountability Organization (GAO) recently released a report that zoned in on the limited measures the government has taken to ensure the safety of driverless cars. The report discusses concerns held by many, including the results of a study that showed most Americans don’t want to be a passenger in a driverless car, nor do they want to be on the same roads and highways as someone else with this type of vehicle. With Thanksgiving this week and the holiday season upon us, many will likely be making travel plans to spend time with friends and family. In fact, AAA is reporting that this year will see the most travel for the Thanksgiving holiday since 2007. This will probably mean more cars on the road and more traffic for drivers across the country to contend with as they navigate the roadways later this week. Experts are warning drivers to prepare for the biggest Thanksgiving travel rush in a number of years. Of course, with more traffic comes the possibility of car accidents, as well. Those planning on traveling this holiday should expect to be on the roadways a little longer, according to a projection by auto club AAA. AAA is anticipating a 4.2 percent increase in travel as compared to last year, with 46.3 million people expected to travel at least 50 miles from their homes during the holiday weekend. If correct, this would be the highest traffic volume reported since the year 2007. Experts are saying that more people are willing and able to travel this year as compared to recent years past due to an improved economy, a larger amount of disposable income, lower gas prices, and overall consumer optimism. With increased consumer confidence, they say, comes an increased desire to travel for the holiday season. Teen driver fatalities in Illinois are down sharply since 2007, and Illinois Secretary of State Jesse White credits the state’s Graduated Driver Licensing program that he championed in 2008 as a key factor. There were 155 teen driving accident deaths in 2007 and 71 teen driving accident fatalities in 2013, according to Illinois Department of Transportation figures that White cited Oct. 20 for the kickoff of National Teen Driver Safety Week. Our lawyers have over 25 years of experience helping clients seek compensation for catastrophic injuries suffered because of another party’s negligent or reckless actions, and that includes design defects. It’s a scary thought to know that there have been 390 million vehicles recalled for design defects since the National Traffic and Motor Vehicle Safety Act of 1966. That’s a pretty massive number, and from it one could certainly infer that there are millions of cars out there that are being poorly made. However, at Levin & Perconti we choose to look at the glass half full; our attorneys see this huge number as a sign that regulatory agencies and automotive companies alike are doing what is right and keeping our nation’s drivers safe. Automotive recalls have saved countless lives, and continue to be a crucial cog in the building of company-client trust. Still, in order for these recalls to save lives, people need to remain informed, and the National Highway Traffic Safety Administration has come up with a plan to help them do just that. It’s a new year; resolutions have been made, and people are looking to the future, wondering what 2015 might have in store. At the very least, the National Highway Traffic Safety Administration hopes that key technological advances will bring a year with fewer traffic injuries and deaths. The NHTSA is our country’s preeminent automotive regulatory agency, and they are always working on one project or another to improve public safety on the road. At any one time the NHTSA is conducting dozens of research-intensive projects aimed at making our lives safer. According to recent reports, one such venture could yield more than $3 billion in profits for the United States economy, and prevent some 300 fatalities every year. If you’re a parent with a teenager, you know that getting them car insurance will cost you an arm and a leg. That’s because young drivers between the ages of fifteen and twenty years old are more likely to be involved in collisions and be killed in traffic accidents than any other demographic. In fact, drivers under the age of twenty are involved in three times as many fatal accidents as all other drivers combined. With that in mind, the National Highway Traffic Safety Administration has developed a strategy to prevent deaths and injuries among teen drivers.